Mattresses, at least the modern concept of one, began way back in the times of the Egyptian Pharaohs. They were the first to have the bright idea of lifting their bedding off of the ground and padding it with palm bows to create a springy surface that was … well, a heck of a lot more comfortable than lying on the ground. Thankfully, mattresses have come a long way since the time of the Pharaohs. Instead of palm bows we have innersprings, memory foam, waterbeds and more. But do these things really help us sleep better at night? You bet! A good mattress will help you wake up feeling refreshed, protect your joints from pressure and strain and also give you a great start on the day ahead. The good news is, that great mattress doesn’t have to cost a fortune. Finding a really good mattress at a reasonable price can seem a little daunting. Certainly there are plenty of fantastic choices for thousands of dollars, but you can get a great night’s sleep on a fabulous mattress without breaking your budget. 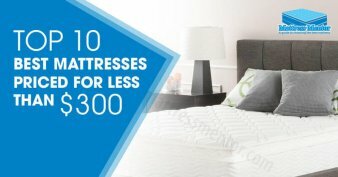 Here is a list of the ten best mattresses priced between $300 and $500 that will give you the quality and comfort you deserve. Signature Sleep created a powerful sleep platform designed to take the pressure off of joints and give you a soothing, soft and comfortable surface for sleep pleasure. The 12-inch Memory Foam Mattress has an ILD rating of 9. ILD stands for Indentation Load Deflection. It is the power that the foam has to deflect the weight placed on it. ILD is measured by the number of pounds that it takes to dent a 4” slice of the relative foam material. Covering the thick, luxurious foam is a soft fabric cover. This mattress is also available in 10, 6 and 8-inch models depending on your desired height preferences. The layered support system of the core foam and dense cover materials provide an excellent relief from hip and shoulder joint stress that is a great choice for side sleepers. The firmness of the material make it good for back sleepers as well, and even stomach sleepers will enjoy the ability to feel comfortable without sinking into the padding. The Signature Sleep 12-inch Mattress has multiple layers of visco-elastic (memory foam) that meets the Federal 16 CFR 1633 Flammability code. It is priced reasonably and a great option for anyone looking for fantastic support at a great cost. For a wonderful night’s sleep, check out the Sleep Innovations Shiloh. It is a medium firm memory foam mattress that gives just enough to allow for full body support for side sleepers, and back sleepers. It may be a little too soft for stomach sleepers, but it has a large framework to fit any body size. The inner core of this mattress is a unique design called DuoComfort™ that is specifically made to give you the most comfortable sleep surface while keeping your body in the healthy alignment no matter what your preferred sleep position is. The bottom layer is 9.5 inches of thick support foam, and the upper layer is 2.5 inches of thick SureTemp memory foam, a next-gen innovation that provides the maximum airflow that keeps the visco-elastic memory foam cooler and give you a better night’s sleep. Best of all, Sleep Innovations has been working to develop the best in sleep products for years and has a strong reputation for quality and consumer support. This mattress comes with a 20-year limited warranty, one of the longest in the industry, and is made in the U.S.A. Even the mattress cover has been created to keep the air flow moving and cool down the surface of the mattress to allow you to enjoy a soothing, and restful night’s sleep. One of the most affordable mattresses that comes in such a wide variety of sizes, the Atlas by Perfect Cloud comes in Twin, Twin XL, Full, Short Queen, Queen, King and California King. No matter what size you choose you’ll love the plush gel-foam inner core of 3-inches of Signature Gel-Plus memory foam at a 4 pound density. On top of the 3-inch gel foam the second layer is 3 inches of double flow temperature controlling comfort foam that keeps the heat from accumulating in the pad. 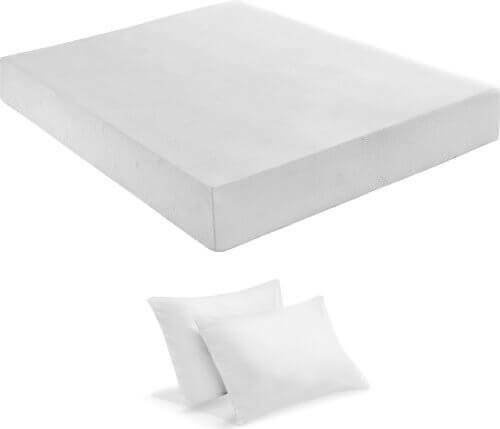 On top of that, a luxurious 3rd layer is 4-inches of additional double air flow foam that increases the support without increasing the heat that is a common complaint with regular memory foam. Even the cover is made to cradle you in luxury. It is a stretch knit removable cover with a suede top for soft, cool comfort. Because it is removable it is easy to keep this mattress fresh and clean just by tossing the cover in the washer and dryer. Perfect Cloud offers a generous 25-year limited warranty on the Atlas Gel-Plus memory foam mattress. Perfect Cloud didn’t skimp on this affordable package. The Atlas mattress complies with all CertiPUR-US requirements. It contains no ozone depletes, is PBDE retardant free, contains no mercury, lead or other metals, does not contain any formaldehyde or phthalates and is low VOC for a healthy sleep atmosphere. This delightful memory foam mattress is made by the industry leader in sleep technology, Sleep Innovations. The Shea is made for people of all sizes, and can accommodate heavier people while still maintaining its strong support and soothing comfort. It is a thick mattress available in twin, full, queen, king and California king. 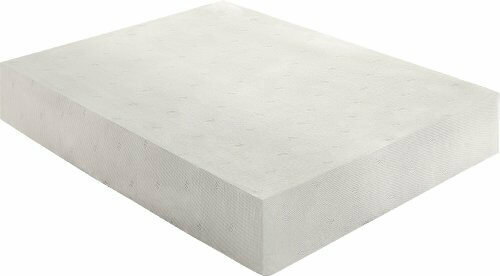 The extra layers of foam make it great for side and back sleepers, but may be a little too thick for stomach sleepers. The DuoComfort design has a 7-inch thick bottom layer that supports the body perfectly and cushions joints while maintaining spine position for back and side sleepers. The Shea 10-inch memory foam mattress comes with a great 20-year limited warranty and won’t flatten, so you really get your money’s worth while getting the best night’s sleep possible. Memory foam is also an excellent choice for people who change positions often during the night. The supple support provided by the foam allows it to stay perfectly molded to your body as you turn, and continue to support you in any position. Memory foam is made of a durable, high-tech visco-elastic material that evenly distributes your weight as you move, keeping your joints supported perfectly. There’s memory foam and then there’s MEMORY FOAM… gel memory foam is a big step up in technology. The idea of a gel mattress may give you the wrong impression, unlike a waterbed, gel does not exactly mean free-flowing, gooey or slushy. Gel memory foam mattresses are actually very small shreds of visco-elastic (usually referred to as memory foam) that are coated in a thin layer of gel that creates an open cell structure that allows air to pass through freely. Unlike solid memory foam, a gel memory foam bed doesn’t heat up, and, maybe more importantly, it doesn’t require your body heat to make it soft and pliable to fit your form. The Lucid 12” memory foam bed has a 2” top layer with a 4 pound rating, that is soft and comfortable, with a stronger, more resilient 8” foam base to provide the best support for your body as you sleep. Because the gel memory foam construction also has a better lifespan, the already very affordable Lucid Gel Foam mattress will give you more value for your dollars spent, and comes with a long, 25-year warranty. 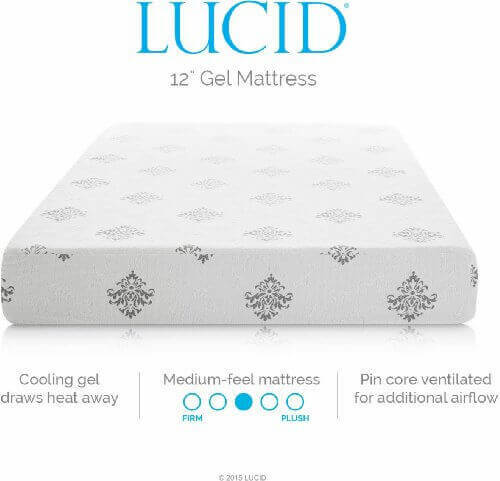 You can enjoy a restful night sleep in a healthy environment with the Gel Foam mattress from Lucid because the cover is easily removable for quick cleaning, and is machine safe. All of the materials used in both layers are CertiPUR-US certified, meaning they are tested and proven to be environmentally safe, meet performance standards and offer the best air quality. The 11-inch gel HD memory foam mattress isn’t just another gel mattress, it combines several advanced sleep technology materials to offer a cutting edge mattress at an affordable price. The Brentwood Home gel mattress has, at its core, a strong, supple gel mattress that incorporates the power of gel memory foam technology to let air flow through and breakup body and room temperature accumulation. The air flow also prevents moisture from developing inside the mattress, which increases the air quality around you. In addition to the thick, supportive gel memory foam base, the cover of the Brentwood Home 11-inch Gel HD memory foam mattress is made of a proprietary bamboo cover that is both environmentally responsible and also extra soft and luxurious. Bamboo is a great fabric for bedding materials because it is durable, but also because it breathes and resists moisture. The Brentwood Home mattress comes in an amazing number of size options. You can choose from twin, twin XL, full, full XL, short queen, queen, Olympic queen, split queen, king, California king, split Cal king, and split king. The top layer of the Brentwood Home 11-inch Gel HD mattress is a 2.5-inch thick gel foam layer that easily adjusts to your body and evenly distributes weight as you move during the night. This keeps pressure off of your joints and protects your spine. Underneath the top layer is a 6.5-inch base with heavy duty memory foam for long-lasting support. The zippered bamboo cover provides the final layer of comfort and protection, and is easy to remove for care and washing. The materials used are CertiPUR-US, so you can be sure there are no CFCs, VOCs, PBDEs, metals and that they meet the requirements for federal flammability standards. 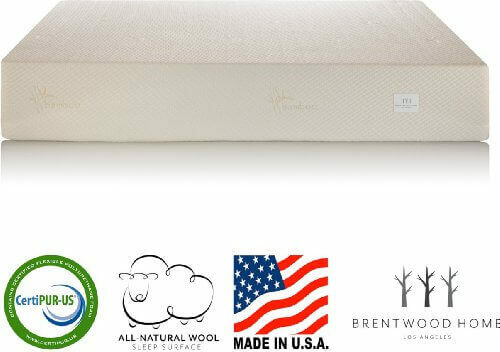 The mattress is made in the US and Brentwood Homes backs it with a solid 25-year warranty. This is a medium/firm mattress that is great for all sleep positions. Looking for a great night sleep in your RV, mobile home or small bedroom? This is the choice that will really get you on the road in style. 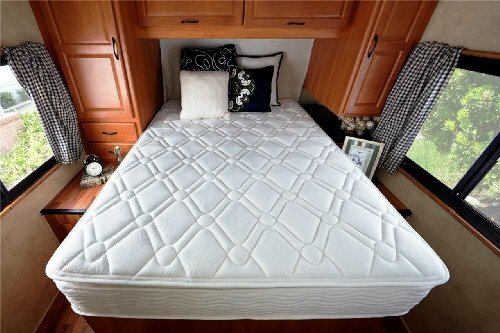 RV mattresses and luxury do not always go together, but they do with the Sleep Master Spring 10 Inch Pillow Top mattress. This cozy mattress comes in several very affordable sizes to match any needs, twin, full, short queen and queen. Inside the Sleep Master you’ll find a combination of high-tech sleep surfaces. On top you have extra thick padding to form a soft, cloud-like cushion. Underneath are several layers of memory foam padding to provide excellent resiliency and support, and finally, a 7.5” iCoil spring unit gives it durability, strength and the ability to buffer motion. All of the layers of foam are CertiPUR-US certified. The Sleep Master Spring 10 Inch Pillow Top RV mattress is made by Zinus, a company with a strong reputation for customer service. They back their mattress with a 10-year warranty and pride themselves on being pioneers in the RV mattress world. It is a medium/firm mattress, and because it has a spring core, it has enough support for stomach sleepers, while giving side sleepers plenty of memory foam support. 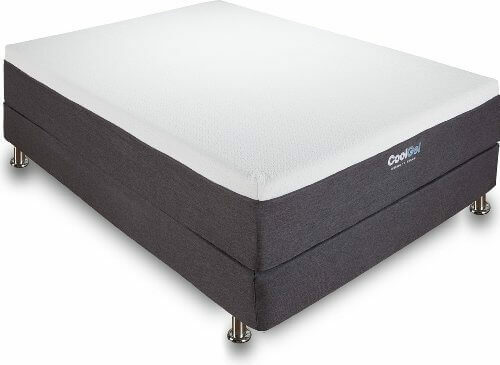 Classic Brands is a name that is instantly recognizable in the sleep industry. They have a great reputation for producing solid, luxurious and supportive mattresses and other bedding. Reputation is important, especially if you are looking for a bargain. You want to be sure that the bargain you buy is going to be backed by a company that cares about you. The Classic Brands Cool Gel 12 Inch Memory Foam mattress is a mid-price bargain with a luxury price quality. The mattress boasts 12 inches of pillow topped comfort. From the thick, resilient Cool Gel layers that are manufactured to provide the ultimate in temperature control and avoid the heat buildup of traditional memory foam mattresses, to the soothing top layer of puffy comfort that lets you sink into a cloud of softness while still getting the power of memory foam protection this mattress is a winner. The materials are all CertiPUR-US certified so you can be sure they are safe and environmentally friendly. The cover is a cozy stretch knit material with a unique waterfall edging that helps you get the most out of your Cool Gel memory foam mattress and is removable for easy care. A little softer than some other memory foam mattresses, the Classic Brands Cool Gel 12 inch mattress is great for side sleepers and pregnant women who need lots of cushioned support for their bellies while protecting their backs and neck. 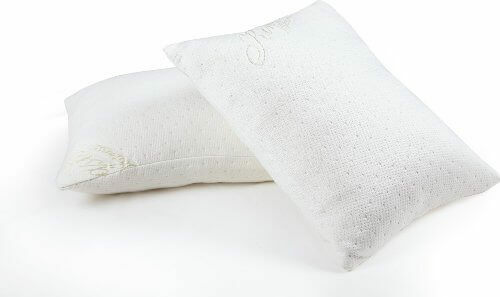 It has a smooth, weight distributing motion that lets you shift in your sleep without putting strain on your muscles or spine, but may be a little too soft for stomach or back sleepers. Classic Brands is always ready to provide great customer service and keep you happy. They offer a 25-year warranty and ship the mattress compressed for easy delivery and lower shipping costs. The DynastyMattress is a great value on a luxurious mattress. It even comes with its own 2 memory foam pillows so you get the complete sleep surface experience at one low price. Don’t worry about the old memory foam heat buildup problem; with this mattress you get HD visco-elastic memory foam that gives you both anti-mite and anti-allergen air quality while incorporating a Cool AirFlow system that keeps its cool even in the warmest climates. With seven sizes to choose from ranging between twin and California king, you are sure to find the right fit for your needs at an awesome price. The materials used are CertiPUR-US certified and DynastyMattress, Inc, backs it up with a 120 day trial and 20 year warranty. It won’t shrink, flatten or cave, and will give you the healthy support you need to wake up pain-free and feeling great. The cover of the DynastyMattress 10-inch AirFlow Mattress zips four ways for incredible removability. Take it off whenever you need to and toss it in the washer for a quick way to improve the atmosphere in your room. This powerful mattress foam combination delivers a one-two punch that makes it the perfect sleep system. Inside the core of this mattress are both high-quality, long lasting foam padding system and a unique blend of air quality mixtures that offer natural solutions to the common memory foam problem of chemical odor buildup. 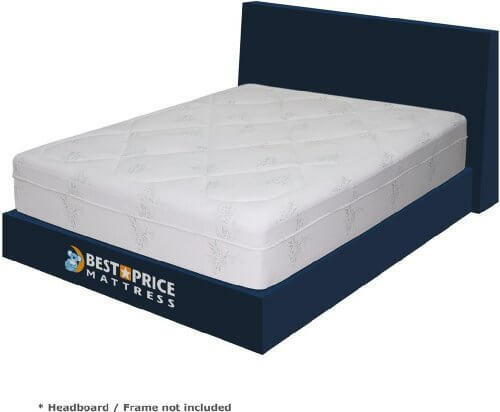 The Best Price Mattress 12-Inch Memory Foam mattress has a combination of green tea, charcoal and castor oil soaked into the foam that create a barrier to give you an odor free comfort zone. The top layer of foam is created with a proprietary blend of bio foam that conforms to your body for the perfect support in any sleep position. It is great for pregnant women too. The top layer also has Cool Foam technology to disperse body heat, and keep your sleeping surface cool and comfortable all night long. Underneath is a large pressure relief system that moves with you as you change positions through the night, and evenly distributes your weight while you sleep to alleviate joint pain. There is an additional 3rd and 4th layer, making this an extremely solid memory foam bed with long lasting, high-density foam construction. The entire system is covered with a bamboo fiber cover that is naturally healthier and moisture resistant. According to the Better Sleep Council, there are certain criteria that make the best options for choosing mattresses. I have covered the 5 things you should always look for here to help you make the best choices for your lifestyle and health needs. When you are looking for a great mattress at an affordable price, it can seem a little overwhelming. There really are a lot of options out there, and it may be difficult to decide which one is going to work best for you. Here are the 5 things you need to consider when choosing a new mattress. Budget: Never forget your bottom line. That may seem like a no-brainer considering you are looking for a reasonably priced mattress, but it is easy to get carried away and begin considering mattresses that are out of your price range. Be firm, you can find everything you need in your chosen price range. Study Your Options: Really get to know what makes each mattress different, and also make sure you know what size you want or need. A California king may be a dream and if you find one that fits your physical needs you may be tempted to jump on it when replacing old sleep products. However, if you buy it and it arrives, then it doesn’t fit into your room it can be a real let down. Certainly you can return it, but then you have to go through the whole process again. Know what you need and can handle both physically and in your space. Utilize Information: The internet is an information highway. Study reviews and the information in this guide to get a real understanding of the mattresses you like. Choose a Reliable Sales Site: You can find mattresses in a variety of places online, but it is always smart to stick with trusted sellers. Websites like Amazon are not popular for nothing. They not only have the best selection and prices, they have established their reliability, safety and performance. Amazon has taken the time to develop a proven track record for customer satisfaction and that translates into security for you. Compare: take the time to really look at all of the mattresses that are similar to the one you have decided on. Once you pick a style and type of mattress, it is a good idea to find out what makes each product of that type different, and also see what the reviews for that mattress say. Real people using the products make compelling points that are a good jump off place for decision making. How you sleep matters when choosing a mattress. Even if you shift a lot during the night, you most likely have a preferred sleeping position. It is important to know what that preferred position is. If, for some reason, you are not sure what position you like best, ask a loved one – a spouse or significant other is a great person to ask. Chances are they have a good idea of the position you like to sleep in. Side sleepers have to have the best support because, even though sleeping on your side is one of the healthiest positions, it also proves problematic. There are a lot of gaps between the surface and the natural curve of your body unless you have a mattress that really molds to your form. Even though it was created for much different uses, memory foam is one of the most powerful inventions created for helping side sleepers get the support they need during the night to prevent pain and restlessness. Back sleepers have a different set of problems. Mattresses that are too soft can allow people who sleep on their backs to sink in too far and cause the spine to curl in an unnatural way. When that happens the head ends up being pushed forward and the chin is forced down. That blocks the air way and making it harder to breathe properly. A firmer mattress is needed when you sleep on your back, but you still want to feel comfortable and pampered. A thicker memory foam, or a combination memory foam and spring mattress are a good choice for back sleepers. Stomach sleeping is a much maligned postion, and yet many people not only prefer it, but can’t sleep in any other position. The main problem with the stomach position is that it puts a lot of pressure on the chest, preventing good circulation and hampering breathing. Soft mattresses also sink in too far, which can curve the spine in an awkward, concave manner that creates tension and even causes pinched nerves. A very firm mattress is necessary to get a good night’s sleep for stomach sleepers. There are other special circumstances that require extra support in a sleep surface. Pregnant women need to have good posture support and usually must sleep on their sides throughout the latter stages of pregnancy. Along with spine support, pregnant women need to have good stomach and back support, even on their sides. A memory foam mattress is a great choice that will help them get a good night’s sleep up to the very last days of their pregnancy. => What to Look for in a Great Support Mattress ? Getting a good night’s sleep doesn’t have to cost a fortune. 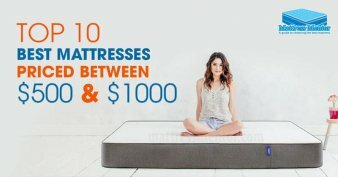 I hope this guide has provided you with the basis for finding the best mattresses for the money. With all of the great choices available from between $300 and $500 it is easy to see how affordable it is to have a high-quality mattress right away. 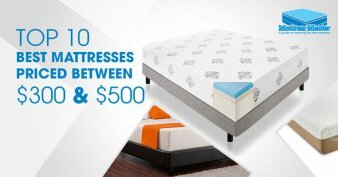 Check out the mattress on the list and find one that is right for you and experience the thrill of waking up rested and pain free right away.